Some things have changed and others have remained pretty much without change since my very first NFBA Annual Conference in Hershey, PA in 1987. Some once familiar faces are no longer with us and others have changed employers. At this year’s 2019 Frame Building Expo, builder attendees were predominately from within a 500 mile radius of our host venue – Louisville, KY. While some might say post frame industry’s heart lies here, I can attest to there being thousands upon thousands of post-frame builders from outside this area who were not Expo participants, for whatever reason. A solution to this may be to reach out to these builders as well as engineers, architects and vendors who have not attended an Expo for say five years. I am talking serious discounts – just enough to cover hard costs of them attending. Stepping now onto my soap box. Let’s start showing our world what post frame can actually do. In my humble opinion, we should have a booth at this year’s National International Builders’ Show. 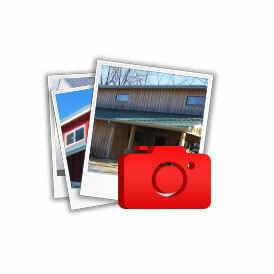 If they have breakouts sessions, let’s offer to do one on post-frame homes. I’d donate my time to man the booth (provided I can get some time to interact with other vendors) and/or be a presenter, just cover my expenses – cheaper than an employee or contractor. 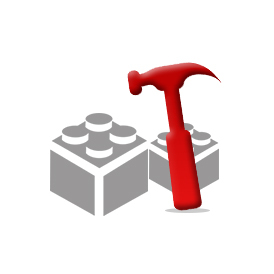 And I actually have some sort of idea as to what I am talking about…..building our industry. Every convert to post-frame buildings brings us a step closer to mainstream. Off my soap box, thank you for your patience. I will imagine attendance will be reported as greatest ever, however my informal visual tells me otherwise as breakout sessions I attended had a plethora of empty seats and there was plenty of walking room between trade show booths. Rarely did I have a significant wait to talk with a vendor and (kudos to them) they universally were willing to give everyone I saw their undivided and individual attention. Never once did I feel slighted. I have to admit I was highly flattered when a gentleman Building Designer from an Eastern state asked if he could have his photo taken with “The Pole Barn Guru”. Instead we spent probably an hour talking post-frame buildings one-on-one in a hall. My Monday through Friday daily blog appears to have become widely read within our industry as I received numerous positive comments. I really appreciate your affirmations and am open to topics any of you would like discussed. Courteous and knowledgeable vendors – they rocked it! Breakout sessions by Kirk Grundahl, “Risk Management & Permanent Bracing of Long Span Trusses” and Aaron Halberg’s, “Vertical Loads on Post-Frame Buildings” were both well-presented and contained good solid information for post-frame builders. On the trade show floor I was impressed by offerings from some more recent vendors. These would include County Line Concepts (www.countylineconcepts.com) with their RidgeRunner 3:10®. RidgeRunner 3:10® has a 36-inch long HDPE high-density plastic base with four custom-designed hardened spring-loaded steel punches. It allows six metal panels to be accurately punched at one time and has adjustable arms for instant spacing of rows of holes. Their Ridgeline9™ easily marks angles on steel panels for accurate cutting on gable endwalls. 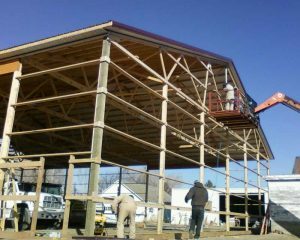 Greiner Building Solutions, Inc. (www.greinerbuildingsolutions.com) has developed contractor friendly systems for column bracing, column marking and builder safety. Permanent Post Systems (www.permanentpostsystems.com) is promoting their unique patented field height adjustable column base keeping building columns above ground as well as at a fixed height. Numerous unscheduled discussions amongst show participants in regards to post-frame building collapses due to Upper Midwest snows as well as talk on how our post-frame industry is heading more and more into residential home markets. Breakout Sessions beginning at 7:30 am Wednesday and 7:00 am Thursday. Just maybe a little too much content has been squeezed into too little time? Breakout Sessions put on by those outside post-frame industry. They just are not as relevant as industry specific presentations. Proliferation of trade show floor vendors who provide steel coil or roll forming equipment. While I am certain your investment into booth space is appreciated, I am unsure if beyond a small minority of Expo attendees are your client base. Very few vendors who actually follow up on Expo made contacts. 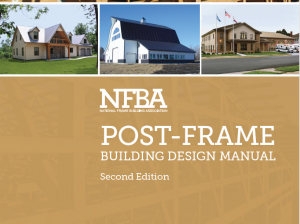 A Commercial Post-Frame Building Design class. Professors Dr. Frank Woeste, P.E. and Dr. Don Bender, P.E. who in the 1990’s taught these on Monday and Tuesday pre-Expo. Personally I found these classes to be a great resource and inspiration, however there has not been a class since International Building Code adoptions. Round Tables. As a NFBA Board member from 1990-1993, I assisted in being a moderator at one of approximately 20 tables of 12. Each round table had a moderator and its own subject. Every 20 minutes there was a “musical chairs”, allowing participants to be able to attend as many as six different discussions over two hours. This was always a show highlight giving participants an opportunity to learn from their peers and brainstorm ideas. Some sort of instruction on building and maintaining websites, blogging, social media, PPC and PPV ads. This might need to be done Tuesday in an all-day program. There could be a nominal charge to cover hard costs and be a “lunch on your own”. A NFBA division for those who supply post frame building kit packages, as well as Building of the Year Awards to their clients who self-build. Long time NFBA supporter and usual vendor National Hardware® (www.natman.com) provider of sliding door components. 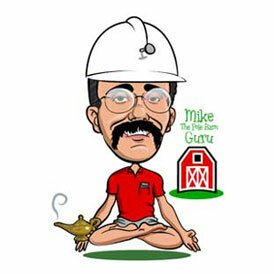 Builders First Source, ABC Supply Company, Allied Building Products, 84 Lumber, U.S. LBM and BMC Stock Holdings. 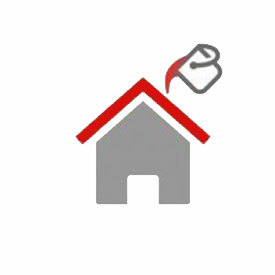 Sectional garage door manufacturers such as Amarr, Clopay, Overhead and Wayne Dalton. Alside, Anderson Windows and Jeld-Wen. Bridger Steel and Union Corrugating. Simpson Strong-Tie and USP Structural Connectors. My Grade for 2019’s Expo? I’d give this year’s Expo a C for being average, not exceptional. Looking forward to meeting you at next year’s 2020 NFBA Expo in Des Moines, Iowa! 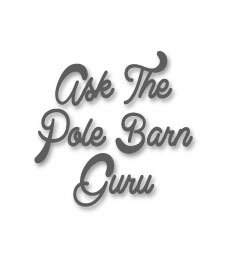 This entry was posted in About The Pole Barn Guru, Pole Barn Planning, Pole Barn Structure, Footings and tagged Kirk Grundahl, permanent bracing, Aaron Halberg, vertical loads, Ridge Runner 3:10, ridgeline9, Permanent Post Systems on April 18, 2019 by admin.